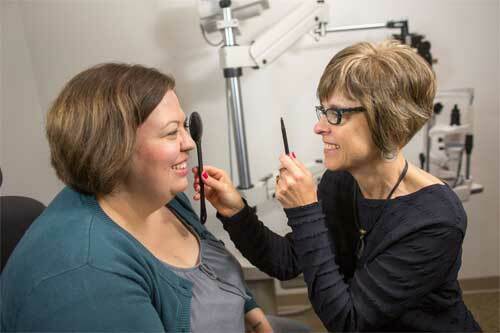 From routine contact lens or eyeglass fittings to complex corneal mapping or your very first eye exam, the CustomEyes approach to eye care is always the same. We take the time to get to know you, your eyes and your lifestyle. Our optometrists treat a wide range of conditions, and the most important one is yours. Learn more about what a comprehensive eye exam is and what problems can be spotted with an eye exam. We love children want to help every kid see and succeed. Read about how we examine and take care of your child's eyes. If you have red eyes, pink eye, or sore eyes, we can help. Last minute appointments may be available. Ask us! A non-invasive medical imaging technique for mapping the surface curvature of the outer structure of the eye. Digital retinal imaging it is critical to confirming the health of the retina, optic nerve and other retinal structures. Glaucoma testing involves measuring internal eye pressure as well as a detailed scan of the retina for signs of disease. How we treat dry eyes, which is the result of the chronic lack of moisture on the surface of the eye. This one-time, comprehensive eye and vision assessment for babies ages 6 to 12 months is a free eye exam! Learn about how Latisse™ can make your lashes look longer and thicker. Get the look you've always wanted. Need immediate care for an eye injury from an eye doctor? We may be able to squeeze you in to avoid ER wait times. Sports eyewear can give you the performance edge you're seeking as well as the safety and eye protection you need. Visit our Eye Library to learn about a variety of topics relating to the eye and eye care. Optometrists at CustomEyes provide eye care and comprehensive family eye health services in 2 locations, so you can choose to have an eye exam in Lenexa Kansas or Lees Summit Missouri, for your convenience. Both eye doctor’s offices are fully equipped with the state of the art optometric equipment for accurate prescriptions, early diagnosis and efficient vision tests. We also have stylish and knowledgeable opticians on hand to help you choose your eyewear, should you require vision correction.